Starting a new project is always exciting. After I applied to a writers grant with my current WIP this February, I decided to start another novel, or rather resurrect an idea I’d developed a year earlier. I already had character sketches and a beat sheet complete, so I rushed right in to writing a scene-by-scene outline only to discover by Act II that I didn’t actually have a story. Well, I skipped some pre-writing steps, things that I knew I should do, but I just got so excited about the characters I’d created and the world I’d built that I wanted to start writing asap! #1 Write a LOGLINE. Broken down to its components, a logline is: FLAWED PROTAGONIST + DESIRE + PROBLEM + GOAL. For example, the logline for ZOOTOPIA: “A too-small bunny (FP) wants to be a cop (D), but no one believes she can do the job and they put her on meter maid duty (P), so she sets out to prove she’s capable of real police work by solving an unsolved case (G).” If you can’t fill in those blanks, you don’t yet have a story. Now, I am a screenwriter so of course I wrote a logline before I began writing (it’d be sacrilege if I didn’t! ), but in retrospect it was too vague: I had a protagonist, but didn’t know her flaw; I gave her a desire, but exactly who and what were standing in her way (the problem) was a bit unclear, and that resulted in an unfocused goal. Bottom line, this short sentence needs to be specific to be helpful. For more detailed tips on writing loglines, click here. #2 Clarify the STORY QUESTION. In other words, what does the reader want to find out from reading your book? Hint: this question revolves around whether the hero will succeed or fail at their goal. The burning desire to learn the answer is what “hooks” a reader into your story. For example, in the movie ZOOTOPIA the story question is, “Will Officer Hopps solve the case and prove she belongs on the police force?” This story question is the spine of the narrative; every scene must make the reader wonder how this question will be answered. For more on hooking your reader with a question, read this. #3 Make a POINT. Every powerful story has a message, so what lesson or warning are you trying to communicate to the reader through your story? This does not mean your novel needs to be preachy; in fact, the point of most stories is very subtle, but if it’s not there, readers will come to the end and shrug, “So what?” To have a point, a human value (such as freedom, love or justice) must be at stake. For more information, read this post on Theme. #4 Know the END CHOICE. Note the word “choice.” Most writers have a general idea of how they want their story to end — the prince and princess live happily-ever-after, the detective catches the criminal, the widow deals with her grief and moves on — but they don’t know what choice the protagonist has to make to get to that ending. Or worse, they don’t have the protagonist choose between anything! It’s absolutely imperative that the hero has to choose between two opposing things that they want (read this post to find out why), and readers must know these things will collide at the end of the story, and not knowing what the hero will choose creates suspense! I dislike stories that don’t have this end choice because they are predictable and boring. Because this is a big pet peeve of mine, I have already blogged about it in this post: How To Write Unpredictable Stories. What about you guys? 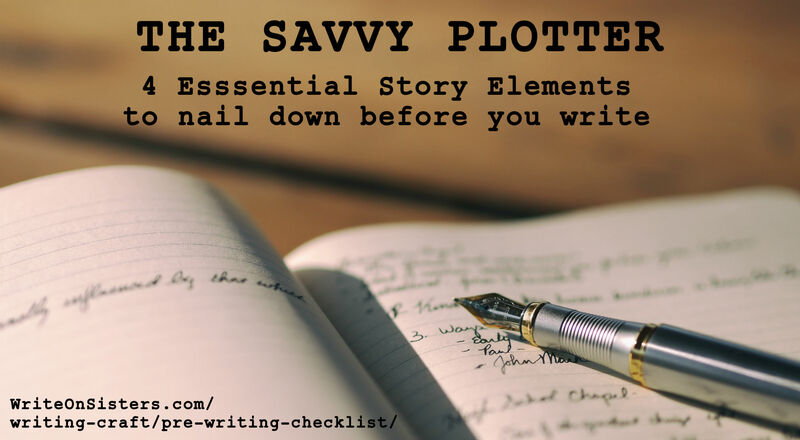 Do you have a pre-writing checklist? Or do you just dive right in to the prose? Similar to what I try to do but add a mind map of ideas alongside, works for me. Ooo, mind maps! I know people who use and love those, though I haven’t tried them yet. Thanks for the comment! This is gold, Heather, thank you! I’m very happy I read this article in this moment. I’m about to start a new project (no, my old one isn’t done yet, but you know… when a idea comes… 😉 ) I’m still in a reseach mode (it will be historical, once again), I’m at such an early stage this outline is too advanced, but I’m happy I’ll have it as reference when I start planning. You’re very welcome! Glad you found the checklist helpful, and good luck with your new project! Interesting take on pre-writing prep, but I’m definitely a pantser and any planning takes the joy out of finding where my mind will take me. This approach does require a lot of rewriting and editing but the joy of the first write is a siren call! I don’t have a pre-writing checklist, per say…. I just try and make sure each main character has some sort of plot arc going on, and it follows reasonable flow, without being too boring/predictable. But I may use some beat sheets and the like for a POV that is giving me trouble. That sounds a bit like a checklist. 😉 Character plot arcs are super important! I’m a manager but your outline just might be the answer to the second draft hatchet jobs. Thank you. I’ll give it a try for the book I’m presently working on. Great! Let me know if it helps. When inspiration hits me, it is usually more or less whole cloth. I see the main character and where he/she is and pretty much where he/she is going. I live with that character while the story develops, and I can see the character evolving and the decisions and actions he/she has to make to get to where he’s going. Often where he’s going changes as the character evolves, because of that evolution. Most of this happens before I set down a word, but often I will jot it down as notes while it happens. I almost feel like I’m living someone else’s life. By the way, I don’t use the beats pattern. I find it rigid and it forces all writing into a generic mold. Or at least, if I’m using it, it’s accidental. I don’t set out to conform to it. But I do work out who the characters are, their relationship to the protagonist and how they are likely to evolve. I just let life happen to them, though, and it changes my original plan. Sounds like you have a very organic pantser method. 🙂 I’m glad it works for you, though I disagree that outlining a story in beats before writing will force it into some generic mold. Stories have a natural structure, and playing with that structure before writing can lead to very original and creative plot twists. But for me, it all comes down to this — how many pages do I want to story edit? 300 pages of prose? Or 30 pages of an outline? I prefer the latter, so I pre-write and outline first. Some writers like to get the whole novel out in full and then edit, so they pick the former option. It’s whatever works for each writer. One way need not be more formulaic than the other. It’s important to set up not only the tag line but characters interactions and the no’s. (translating into the thing that must not happen even if i’m tempted to do it.) I find it very helpful. I dive right in. Sometimes I have a beginning and end in mind and it’s a matter of filling in the middle. The free spirit approach! But do you ever get halfway through and realize, “Whoops, there’s not really a story here” and scrap it? I’m just curious, because that is what would happen to me. ;-/ Or do you just roll with it until the story works itself out? I roll it out. However I will try your method. It might save some serious rewrites. Thank you. I’ve got my share of notes on themes, characters, situations and settings in several computer files. Some have been sitting there for months. It’s like collecting lumber, wire, pipes and cement in preparation for building a house, but forgetting the first step in building is deciding what kind of house I want. Thank you for the reminder. A wonderful analogy! That is exactly what it’s like. Thanks for the comment, Robert! Exactly! Thanks for the comment, Marti! I must admit that when I start to write, none of this occurs to me. I just have to get it out of my head. Eventually I go down the ‘where is this actually going?’ route but a lot of it escapes me at the time and I definitely have difficulty with the loglines (I suspect this is because I’m not really that clear on the plot)! I am going to try, try, try to follow these four steps – for my existing stories and new ones. Previous Previous post: Story Twinkies: Do You Need One?